Power supply AC / DC. Expert advice available via telephone. 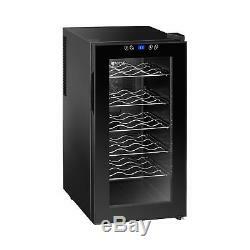 Small Wine Fridge - 50 l.
Temperature range: 11 - 18 °C. Do you have a question? 6 shelves offer space for up to 18 (wine) bottles. Peltier cooler - highly reliable and environmentally-friendly cooling system. Extremely quiet appliance at only 38 dB - one of the quietest on the market. LED lighting for minimum power consumption. Ideal temperature range of 11 - 18° C. Height-adjustable feet of up to 10 mm - for optimal footing no matter the surface. 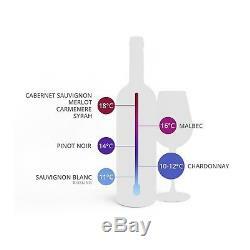 Many wine varietals should be stored and drunk at a specific temperature. 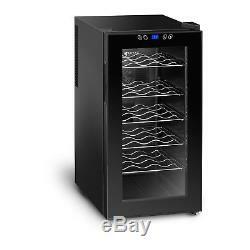 With the wine fridge RCWI-52L , you can ensure the proper temperature and optimal storage for your wine. Of course, you can also use the refrigerator to store any other kind of beverage - and not just on hot days. Blue LED lighting attractively illuminates the contents of the fridge to highlight the special flair of your beverages. This durable appliance is the perfect addition to your home bar or for flexible use in hotels, cafes or restaurants. Cool refreshment from the wine fridge from Royal Catering. 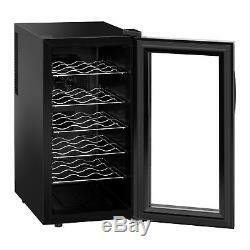 With a capacity of 50 litres , the wine fridge offers plenty of space to store up to 18 standard wine bottles. 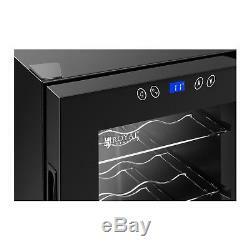 The six wavy inserts are designed to store wine bottles at the professionally-recommended angle. This position allows each bottle to develop its unique aroma for your guests to enjoy. At just 38 decibels, the wine cooler makes less noise than a softly purring cat. Thanks to the extremely low noise level, the wine fridge is perfect for living spaces where your guests can spend time undisturbed. You can also set up the wine fridge at meetings, where every sound can be a disturbance, without worrying. This model is a Peltier cooler, which guarantees that the device will quickly reach and maintain the temperature you set. This special cooling system creates less noise and vibration that conventional refrigerators. It is also highly reliable and environmentally friendly. The appliance is equipped with two additional cooling fans which distribute the cold air around the interior. With a temperature range of 11 to 18 °C , you can set the exact temperature necessary for your beverages of choice. If, in addition to white wine, you are also storing beer, cider, soft drinks or juice in the fridge, you can adjust the temperature accordingly. The LCD display allows you to easily control the temperature, as well as choose between Fahrenheit and Celsius. The striking LED lighting is sure to be a visual highlight, allowing you to skillfully and attractively present select wines. In addition, LED lights do not emit heat like traditional lightbulbs, guaranteeing that the temperature in the wine fridge will remain at the desired level. The refrigerator door is made of double-layered tempered glass , making it especially durable. The space between the two layers is filled with air, which serves as thermal insulation, preventing temperature transfer between the cool interior and warm exterior environment. The door is easy and quiet to open and close. The powder coating is a high-quality design feature that is both attractive as well as providing a long-lasting and resilient surface. Powder-coated refrigerators are better-protected against bumps, moisture, chemicals, UV light and other environmental conditions than other appliances with lower-quality finishes. It also reduces the risk of scratches, abrasions, corrosion, fading, and other signs of wear. Thanks to the height-adjustable feet with a range of up to 10 mm, the wine fridge can be adjusted for any location and stand sturdily on uneven surfaces as well. The design, including easy-to-remove shelves and easy-care materials, makes the device easy to clean. 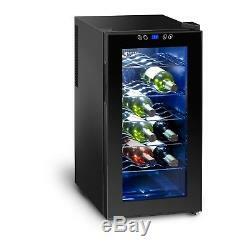 Allow yourself to be convinced by high quality and great service - order a small wine fridge from Royal Catering today! 230 Volt / 50 Hz. 50 litres / 18 bottles. 27.5 x 27.5 cm. 48,5 x 35,5 x 66,5 cm. 52,5 x 40 x 68,5 cm. Technical drawings in English - download PDF. Royal Catering offers low priced tools for professional catering businesses with high demands for high quality and reliability. All tools offered by Royal Catering have been made especially for intense daily use. For that matter all devices are produced by our high quality requirements. Due to the use of only top class materials all devices are robust, long lived and simple and easy to clean. All our products designs will save you a lot of time studying instruction manuals since they were produced to be operated intuitively. The item "Small Wine Fridge Mini Drinks Refrigerator Cooler Chiller Hotel 50L 18 Bottles" is in sale since Monday, November 19, 2018. 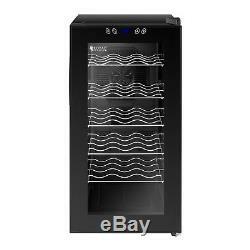 This item is in the category "Home, Furniture & DIY\Appliances\Fridges & Freezers\Wine Cabinets/Fridges".international" and is located in Berlin. This item can be shipped to all countries in Europe.